Prep Day: Preheat oven to 350°F. Finely crush 37 of the wafers. Spread Coconut evenly in shallow baking pan. Bake at 350°F for 7 to 10 min. or until lightly browned, stirring frequently. Or, spread in microwaveable pie plate. Microwave on HIGH 3 min. or until lightly browned, stirring every minute. Watch carefully as coconut can easily burn. Mix wafer crumbs, coconut, almonds and butter until well blended. Press firmly onto bottom of 13×9-inch baking pan. Bake 8 to 10 min. or until lightly browned; cool. 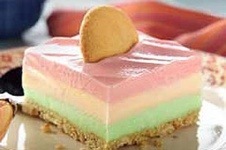 Spread layers of each of the different flavored sherbets over cooled crust, freezing each layer until firm before topping with the next layer.Freeze at least 4 hours. Serve Day: Remove from freezer about 10 min. before serving; let stand at room temperature to soften slightly. Cut into 24 squares. Top each with 1 of the remaining 24 wafers just before serving. Store any leftover dessert in freezer.